How could the world have become so mixed up? Out of this spiritual wilderness, a voice cries out in clarity and power, decrying this world confusion, with the reassuring TRUTH of the world's only and SURE HOPE! NOT ONE knows WHY humans were placed on earth—the real PURPOSE and MEANING of life! You live in a world seemingly far advanced in science, technology, higher education and diffusion of knowledge. We think it's a world of GREAT PROGRESS. We send men to cavort about on the moon, and return them safely back to earth! Unmanned spacecraft land on Mars, and send back to earth close-up photographs of the Martian surface! Other unmanned spacecraft fly close to Jupiter and send back astonishing pictures of Jupiter! Surgeons transplant human hearts! It's a magic, entrancing pushbutton world where work is done largely by machines. It's the glamour dream world of the three "L's" — leisure, luxury, and license. But paradoxically, it's also a world of IGNORANCE! Even the educated know not how to solve their problems and the world's evils! It knows not the way of PEACE OT the TRUE VALUES of life! More than half of the world's population is still illiterate, in the grip of abject poverty, living in filth and squalor! The grim reapers of starvation and disease take human lives by the millions! It's an unhappy, restless world in frustration, staring a hopeless future in the face. It's a world ridden with escalating crime and violence, immorality, injustice (even in its courts of law), dishonesty, corruption in government and business, and continual wars, pointing now to the final nuclear World War III. WHY this paradox of "PROGRESS" amid DEGENERATION? True religion—God's truth—would have pointed the way, and led to happiness, abundance, and eternal salvation. What is religion? It is defined as the worship of, and service to, God or the supernatural. It is man's relation to his Creator. Some religions have perverted that definition. They worship not the God who created them, but gods which they have created. Religion involves one's conduct, his principles, his way of life, and his concept of the hereafter. 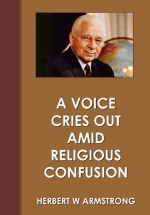 The real CAUSES of all this world's religious confusion—and all its evils—are revealed in SEVEN BASIC TRUTHS that decry this Babylon of religious confusion and the resulting world chaos! But now God's time has come! He now sends a voice to cry out with amplified world covering power to reveal the way out of this senseless madness, into the world of PEACE and righteousness that soon shall grip the earth! In the book of Isaiah is a "Now" prophecy: "The voice of him that crieth in the wilderness, Prepare ye the way of the Lord. ... lift up thy voice with strength; lift it up, be not afraid, and say.... Behold, the Lord God will come with strong hand, and his arm shall rule for him: behold, his reward is with him, and his work before him" (Isaiah 40:3, 9-10). The prophet Malachi confirmed this: "Behold, I will send my messenger, and he shall prepare the way before me: and the Lord, whom ye seek, shall suddenly come to his temple, even the messenger of the covenant, whom ye delight in: behold, he shall come, saith the Lord of hosts" (Malachi 3:1). Both of these prophecies have a dual application. First, they refer to John the Baptist, who prepared the way before Jesus' human ministry more than 1900 years ago. BUT, as a type, or forerunner, they foretell one to prepare the way before Christ's SECOND COMING as the King of kings and Lord of lords to RULE over ALL NATIONS! Malachi's prophecy, like Isaiah's, if you will read on past the first verse, refers primarily to a human messenger preparing the way before Christ's now imminent SECOND COMING, this time in supreme POWER AND GLORY as Ruler over all nations! Understand the duality principle here. These prophecies refer to a "type" or forerunner. John the Baptist was a voice crying out in the physical wilderness of the Jordan River area, preparing for the human physical Jesus' first coming to a material temple at Jerusalem, to a physical Judah. But that was a type, or forerunner of a voice "lifted up" (greatly amplified by modern printing, radio and TV), crying out in the midst of today's spiritual wilderness of religious confusion, announcing the imminency of Christ's SECOND coming as the spiritually GLORIFIED Christ, to His spiritual temple (the Church resurrected to spirit immortality). He came, over 1900 years ago, to announce the FUTURE Kingdom of God. He's coming this time to ESTABLISH that Kingdom. That end-time last warning message is now going out worldwide in amplified power.